Fundraiser by Meg King-Abraham : Keep Once Upon A Crime Books open! 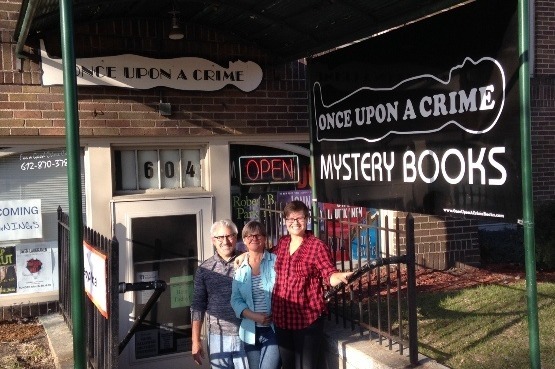 Once Upon A Crime is an independent mystery bookstore in Minneapolis and has been an integral part of the mystery community for 31 years. My husband Dennis and I bought the store in April 2016. Our daughter, Devin, manages it and is the only employee. Both Dennis and I have full-time jobs. We love Once Upon A Crime and the community we have found here, but we are currently having financial difficulties. Due to a decrease in sales, we are carrying more debt, in addition to the original loan allowing us to purchase the store. The Whittier/Uptown neighborhood is going through many changes which have impacted the store's finances. A bike lane was put in on the street, eliminating our closest street parking. The neighborhood is also going through construction and road work, making getting to the store difficult. We are hopeful that when this work is complete, our location will once again be easily accessible for book lovers! Our customers love this specialized award-winning store. People who discover us are very excited by the huge selection of all mystery genres. We regularly host author events letting people meet their favorite authors and find new ones. Devin provides excellent customer service and is always willing to give recommendations or place special orders. Many bookstores have found that they need to supplement their income from book sales by selling other merchandise and/or offering a coffee shop/cafe. In our location, that is not a possibility. If you have ever visited, you are aware of the incredible amount of books we carry in a very small space! The funds will allow us to keep this treasured bookstore up and running. We are confident that if we can pay off a portion of the debt, we will be able to maintain the business for many years to come! We are often thanked for taking over this wonderful store. We are working hard to make some changes while retaining the identity and special charm of this bookstore. We want to be able to continue the tradition of having a wide selection of mysteries that you just can’t find anywhere else, but we can’t do that without your help. Your support would be greatly appreciated! Thank you so much! We have exceeded our goal. We are working hard to get our e-commerce site started. We continue to examine our current location for viability. We would like to thank all of you who have donated to and/or shared our campaign! It has been only a week since we began and we are almost at $20,000.